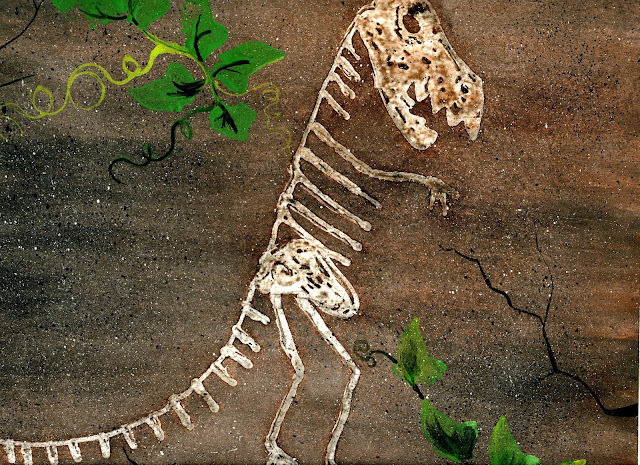 The students will learn about Argentinean fossil digs and will complete a watercolor resist dinosaur fossil art project. 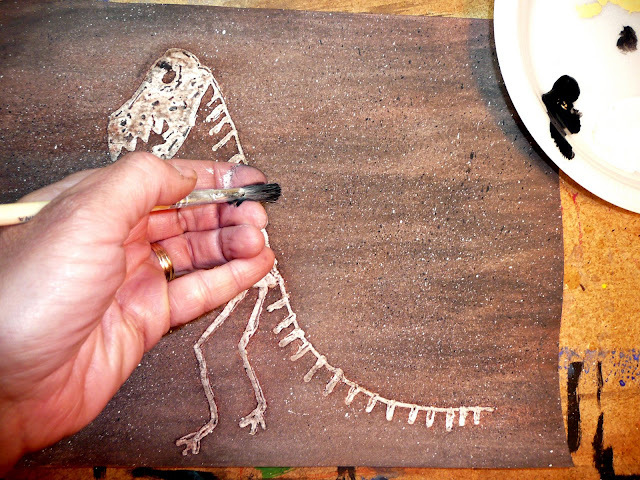 30 minutes – Paint and add details to dinosaur “fossils” and let dry. The World Cup country that you are studying is Argentina. This country is rich with dinosaur fossils and is home to one of the largest dinosaurs ever found, the Titanosaur. We are going to talk more about dinosaurs in Argentina in just a moment (and you'll even get to do your own "excavations"! Today, we are going to be making our own watercolor resist dinosaur fossils. We will draw a dinosaur, trace over it with our white crayons or oil pastels, and then paint over the pastels so that it will “resist” the paint, making it look like the Argentinean dinosaur fossils. Let’s get started. Step 1. Hand out a sheet of watercolor paper and a dinosaur template to each student. 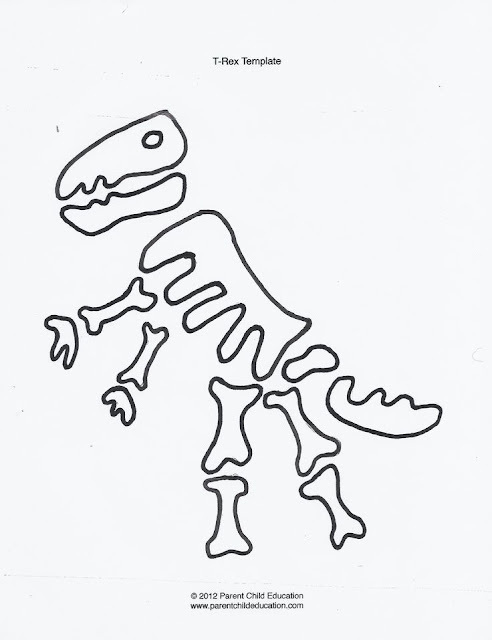 Have the students lightly pencil in a dinosaur fossil either as a guided draw or using the template (provided in above) as a guide. Step 2. 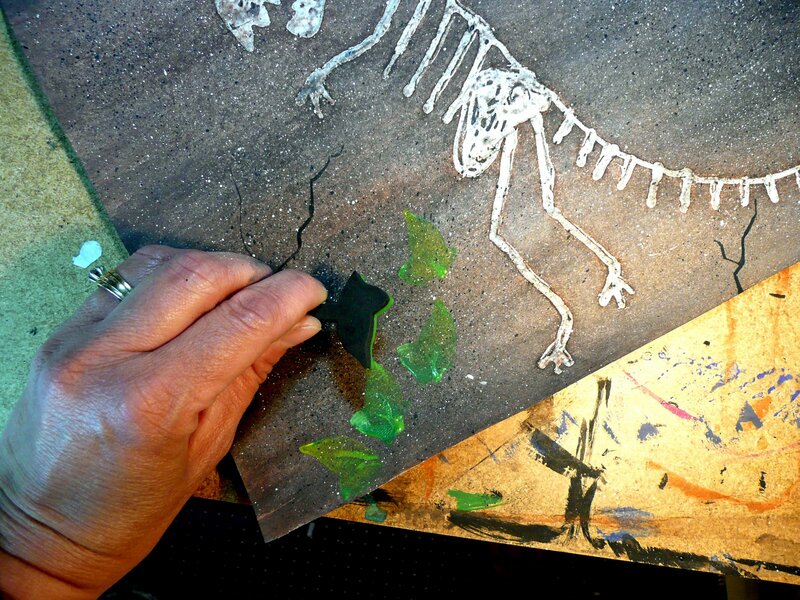 Using a white crayon or oil pastel, have the students outline their dinosaur skeletons, pressing hard. Outline all areas and then color in the outline of all of the bones (except the eye - leave that blank). Step 3. Once the pastel work is completed, use liquid watercolor paint wash to paint over the resist - just a few passes over the pastel should do it. 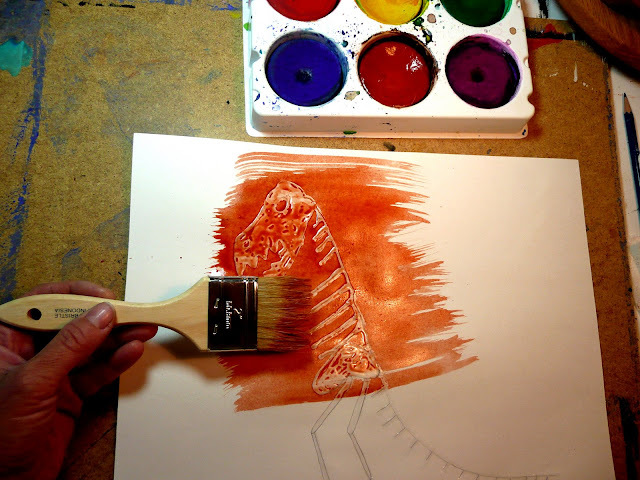 If the students want different colors (or to deepen or lighten a shade), let the paint dry and paint over it again. A good combination is to do a warm brown, let dry and then do a black wash over the top. Step 4. 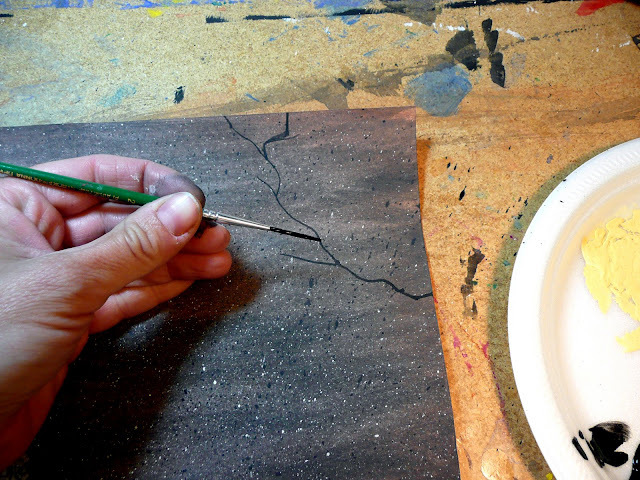 To make the background look like rock or stone, splatter cream and black onto the page. Using an old toothbrush (and adult supervision) place the picture into an old cardboard box, dip the toothbrush into paint, remove excess and spatter using your fingers on the brush or by tapping the toothbrush with another paintbrush. Step 5: Encourage the students to add details. Using the black ultra-fine Sharpies, include “cracks” in the rock to make it look more like a fossil. Using the stencils, foam stippling brushes and green paint, add leaves. (Use Sharpies instead of paint). (Use stencils instead of stamps). Argentinean Dinosaurs and Fossil "Excavation" Activity. Discuss with students why Argentina, particularly Patagonia, is a good site for dinosaur research. A land bridge connected North and South America in the beginning of the Cretaceous period about 144 million years ago. When it disappeared later in the Cretaceous period, dinosaurs on the two separate continents evolved in unique ways. In addition, the terrain in Patagonia is ideal for fossil hunting. The area is rocky, with many layers of sedimentary rocks, such as shale and sandstone. Paleontologists tend to find most fossil remains in areas such as that. We can learn a lot about these dinosaurs and the environment in which they lived by studying dinosaur fossils. Imagine finding something that lived on Earth millions of years ago. Like we saw in the video, that is what paleontologists do. These scientists look for fossils. A fossil is what is left of an animal or plant that lived long ago. Many fossils are the bones of animals that were buried. Over many years, they got buried deeper, and the bones and nearby soil hardened into rock. Then paleontologists dig up fossils to study. Distribute one paper plate, chocolate chip cookies, and one toothpick to each student. Tell students that they are going to try to remove the dinosaur fossils (chocolate chips) from the ground (the cookie) without breaking the fossil or the ground. Give students about 10 minutes to complete this activity. After students have completed the activity, ask them to explain why removing fossils from the ground might be difficult. 1. How do scientists know where to look for fossils? Sometimes weather wears away the soil and uncovers a fossil. Other times, builders find a fossil when they dig. That is a clue that there might be more fossils deep under the ground. So scientists use bulldozers to dig away chunks of rock and soil. 2. Workers then use shovels, drills, hammers, and chisels to get the fossils out of the ground. The scientists dig up the fossil and the rock around it in one big lump. They must be careful not to break the fossil as they dig. 3. Paleontologists have to keep careful records of the fossils they find. They measure, draw, and take pictures of the fossils. They use this information later, when they work with the fossils in their laboratories. 4. The parts of the fossil that stick out of the rock are sprayed or painted with a special glue. This helps to make the bones strong. Then the fossil and rock are wrapped in bandages covered with plaster. This protects the fossil so it will not break when it is sent to the lab. 5. The fossils are labeled and placed in crates with soft padding. These crates help protect the fossils from breaking. The crates are carefully loaded onto trucks and sent to the lab. There, scientists will use the fossils to learn about creatures of long ago. Do you think it is important for us to study animals that lived long ago? Why or why not?